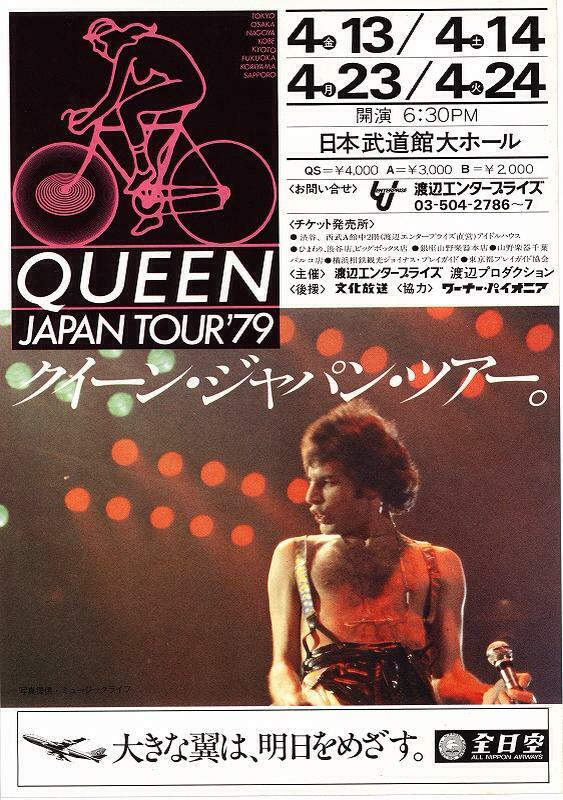 This tour poster indicates that the fifth night in Tokyo was added due to ticket demand. Freddie is simply done for, as this is the 6th show in 7 nights. This is probably the worst shape his voice was ever in, to the point where he could barely make it through most of the songs. After Somebody To Love, he says, "This brings us to the last concert in Tokyo for a while, and we're gonna bust our balls for you tonight. That means we're gonna put on a good show. We're gonna try, I tell you!" - an obvious reference to his ailing voice. The rest of the band are in spectacular shape, and make up for any of his shortcomings. 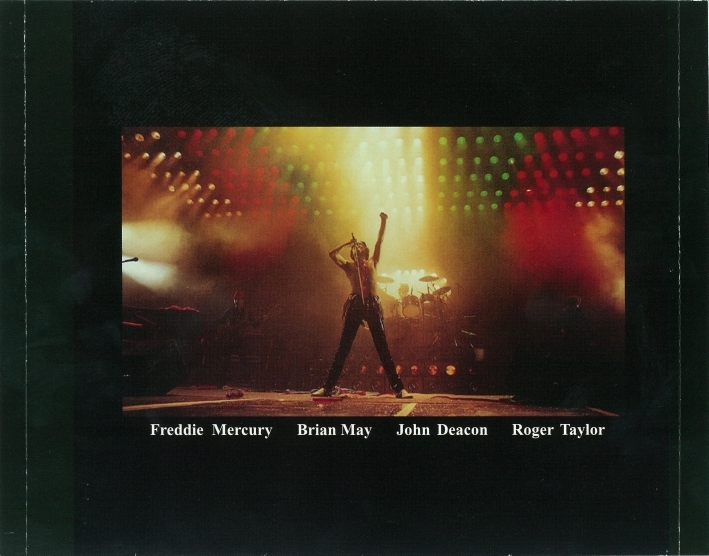 Freddie, after Now I'm Here: "Straight away, we'd like to introduce Brian May on the piano." He looks over to Brian and says, "You've got my job today." Freddie struggles on the high notes in this version of Teo Torriatte, but any Japanese fans who notice probably don't care, and simply appreciate the gesture of Queen playing their special song for them. Following Dreamers Ball, Brian does the band introduction as he does at most shows on this tour, but each time it's a little different. After Roger lets out one of his usual big screams, Brian begins, "Ladies and gentleman, on drums and screams, Mr. Roger Taylor! On bass guitar and Japanese shirts, Mr. John Deacon! 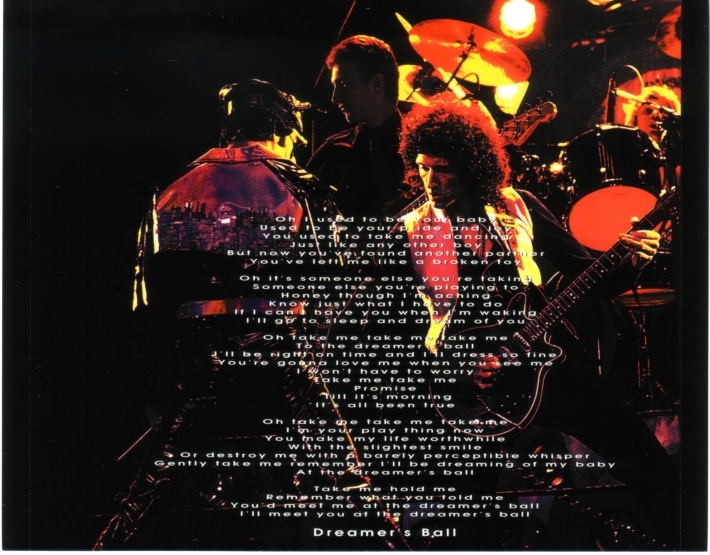 And on silken vocals, Mr. Freddie Mercury!" Love Of My Life is dropped for this show, as it is a showcase piece for Freddie. This is probably the only occasion when he isn't able to pull it off. "Just throwing some of your junk back to ya!" says Freddie to the enthusiastic audience hurling things onto the stage after It's Late. 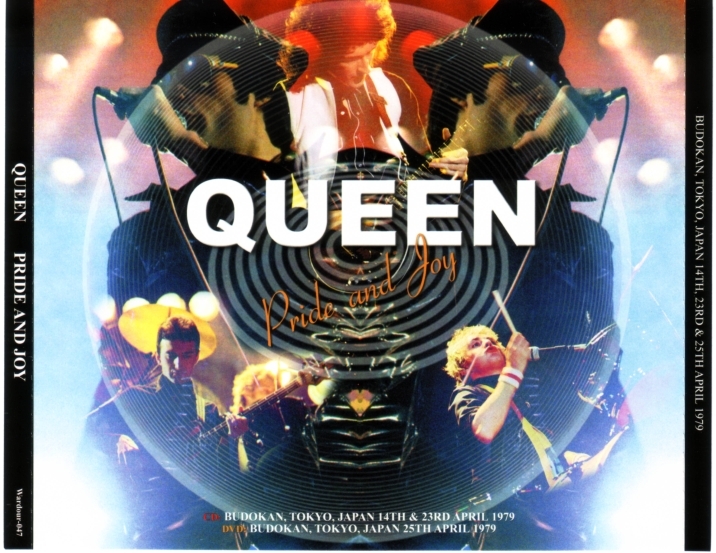 "We have a song that features John, Roger and Brian. They're gonna improvise a little. This is a song called Brighton Rock." About a half hour of footage from this show was broadcast on Japanese TV. Bits of I'm In Love With My Car, Dreamers Ball, and Brighton Rock are seen on the A Night At The Opera 30th anniversary DVD. The whole show most likely exists in the Queen archives. See this table for details. 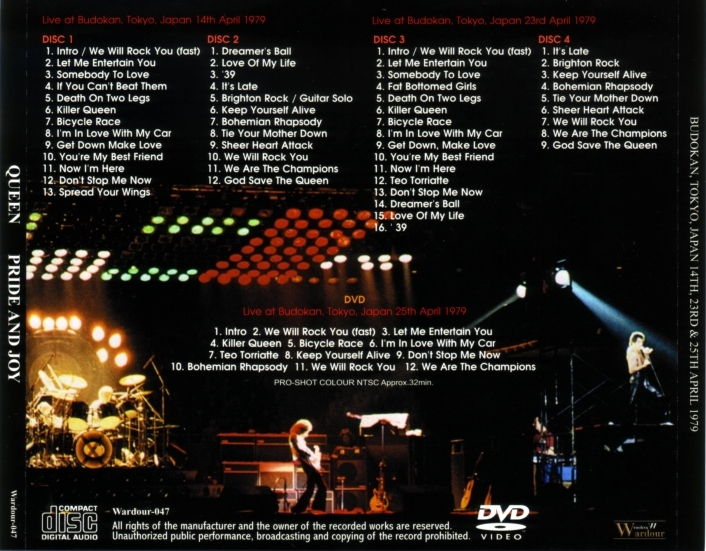 In November 2009, the band posted some concert videos from the 70s on their website in conjunction with the release of their "Absolute Greatest" compilation, including We Will Rock You (fast) and Let Me Entertain You from this show. While it is still mono audio, the picture and sound quality are better than ever before. The Love Of My Life promo video presents a curious situation. 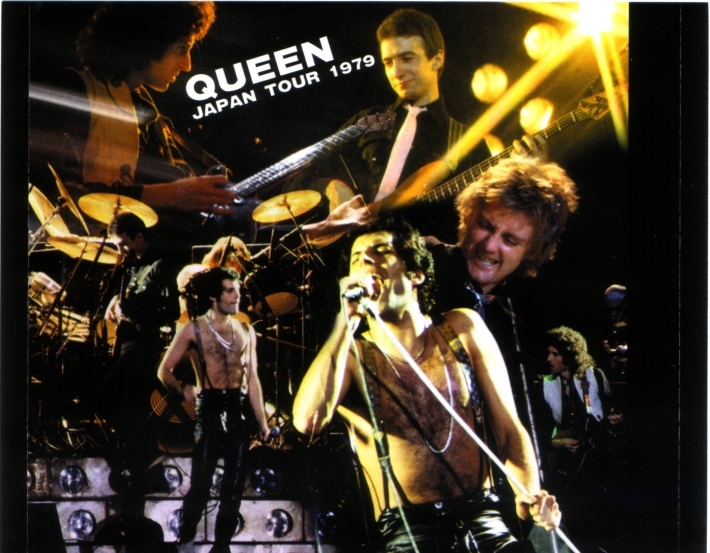 While the Live Killers audio of the song was used, it seems that most of the video footage comes from Japan, as Freddie is seen wearing his blue suspenders. But since the band didn't perform the song at this concert, it's reasonable to suggest that the footage was shot during the day, since the film crew was already there to be utilized. Note that there is never a genuine shot of Freddie or Brian with the audience at the same time. However, since the video shooting isn't mentioned in the itinerary, then perhaps the video shoot took place on April 23rd or 24th. Either way, it can be safely said that Japanese footage was predominantly used for the Love Of My Life promo video, and some bits of footage from Paris are woven in. A few shots from Teo Torriatte from this show were used as well. This audience source is average quality and just about complete. This bootleg contains the best of the three audience sources from this show. God Save The Queen is missing. Dreamers is often misspelled as "Dreamer's", as on this bootleg. This third audience source sounds well below average. The video footage on this silver is a straight copy from Japanese TV in both wonderful picture and sound quality. Bohemian Rhapsody cuts out after the guitar solo, during which Brian fumbles a bit towards the end. 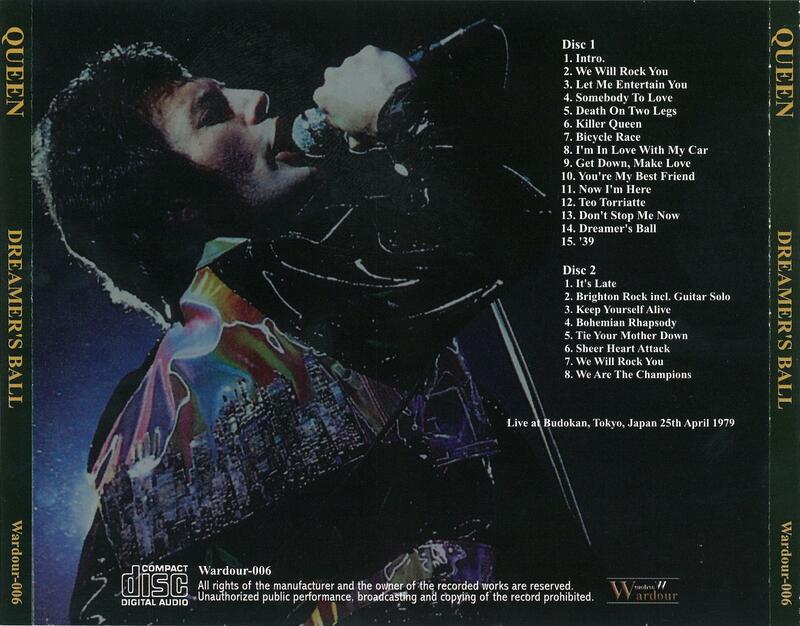 A few bars of the We Will Rock You guitar solo are cut too, presumably because Brian has some tuning issues (or breaks a string) as heard on the audience tape. This set also includes audience tapes from the April 14th and April 23rd shows.